Published on September 15, 2017 in Winnipesaukee Resort. Closed Tags: fall foliage, scenic fall drive, Winnipesaukee Resort. 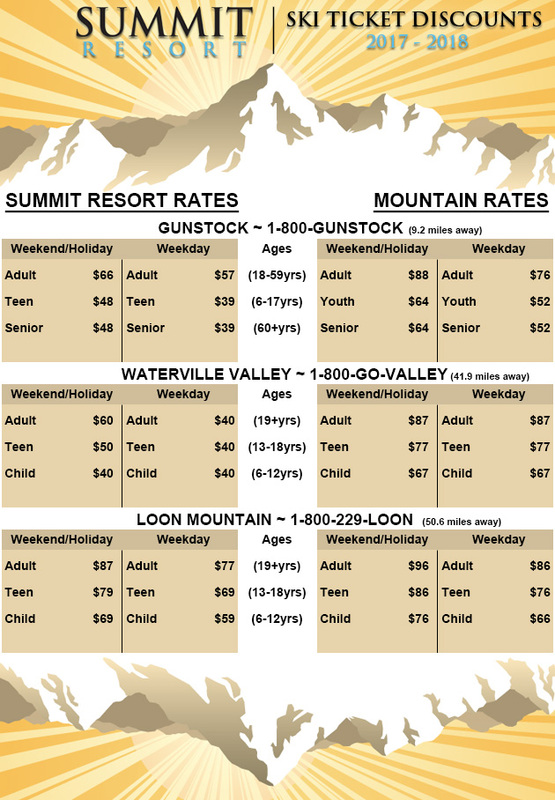 The Summit Resort is centrally located in the New Hampshire Lakes Region offering close proximity to Weir’s Beach, and some of the best fall foliage viewing in the state. 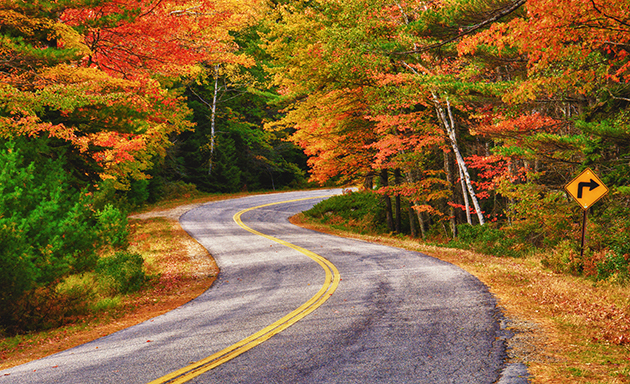 It’s the perfect time of the year to enjoy a scenic drive around Lake Winnipesaukee. Take note of the beautiful fall colors, don’t forget to get out and stretch your legs along the way for some great food and tax free shopping. For more information on the towns you will be driving through check out the blog from our sister resort on Lake Towns here. Start your day off taking Rt. 3 From Weirs Beach, all the way into Meredith Town Center. Grab some delicious breakfast at Sunshine and Paws and take a walk-through downtown for some awesome shopping and lakeside views before hopping back into your car. From Meredith town center, continue on to Rt. 25 until you hit Center Harbor. 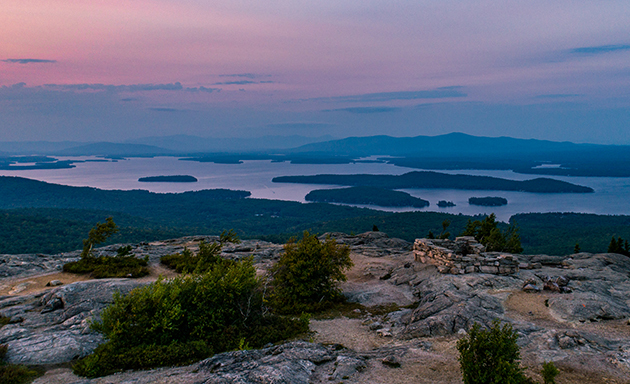 Don’t blink, because this small town packs a lot of New Hampshire punch. This section of the lake avoids the heavy crows that Meredith and Weirs Beach bring while offering a variety of excellent restaurants and inviting shops. Enjoy the small town charm and appreciate the beautiful oranges and reds on the trees surrounding the route. While in town don’t forget to head down to the lakefront and check out our new sister resort, the Center Harbor Inn. Once through Center Harbor and into Moultonborough, hop on Rt. 109 and head towards Wolfeboro. The long stretch on 109 is surrounded by beautiful trees and will give you a front row seat to the famous fall foliage of New Hampshire. Keep your eyes peeled for some beautiful houses along the way. There are a few spots that give you clear views of the lake right in Tuftonboro, pull off to the side, step out, and enjoy the fresh crisp air coming off the lake and take a photo with your family before getting back in the car and heading towards Wolfeboro. Once you hit downtown Wolfeboro find a place to pull over on Main St. to get out and stretch those legs. 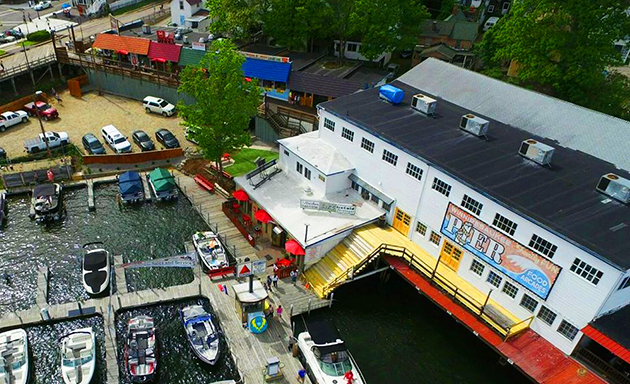 Wolfeboro is your quintessential lake town, downtown is located right on the southeast shores of Winnipesaukee. With coffee shops, boutiques, and restaurants, you can enjoy being on the lake without actually being on the lake. Try one of our favorite spots for lunch at Garwoods! They are open year-round and offer a waterfront patio overlooking Wolfeboro Bay. Whether you are craving seafood, or a hearty fall soup, they have it here. From Wolfeboro take Rt. 28 until you hit Bay Hill Rd. and take a right onto Rt. 11 on Mt Major Hwy, where you will cross the Southernmost point of the Lake at Alton Bay. Continue onto 11 until you get to 118 and take that straight back to the Summit Resort. The entire drive should take about 1hr 45min, with stops along the way you can make a full day of experiencing Fall in the New Hampshire Lakes Region. This is a lakeside adventure you will remember for a long time. Published on August 18, 2017 in Winnipesaukee Resort. Closed Tags: Lake Winnipesaukee Resort, NH Lakes Region, nh public beach. 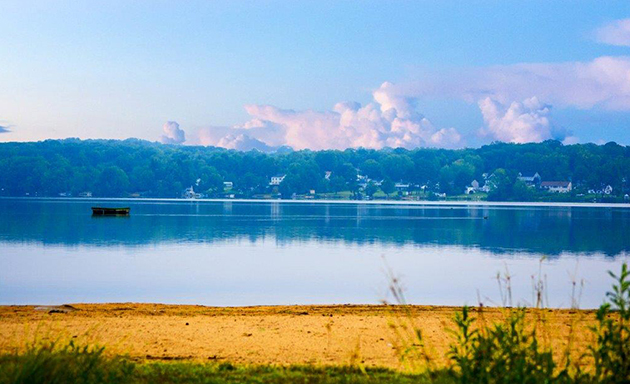 The Summit Resort is centrally located in the NH Lakes Region within close proximity to a few amazing public beaches. Each location offers unique features that appeal to different vacationers. 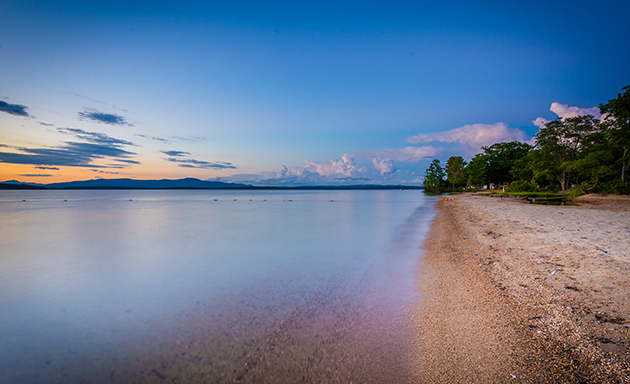 Weirs Beach, less than two miles from the resort, is one of the more popular spots on Lake Winnipesaukee. 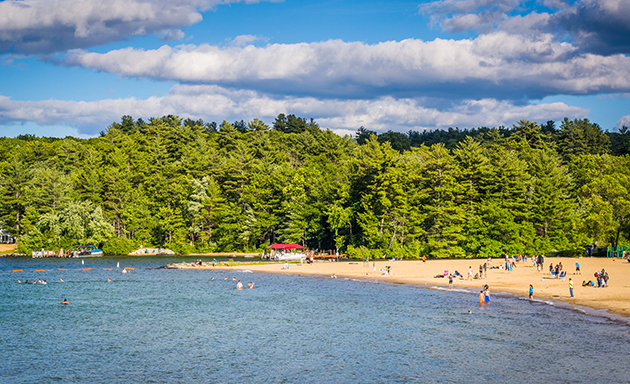 Ellacoya State Park, part of NH Parks and Recreation, offers many amenities so your family can stay for a full day of fun. Opechee Park, located in Laconia, offers a more relaxed and quiet setting to enjoy the day. 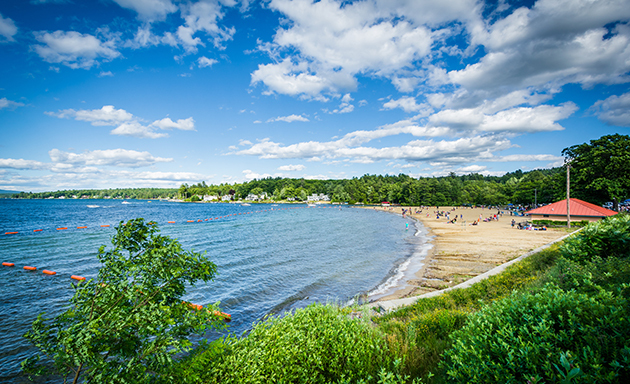 Weir’s beach is located in the heart of Laconia just a mile and a half from Summit Resort. This is one of the most popular spots in the lakes region. With a boardwalk, pier, and many restaurants the Weirs always attracts a crowd. 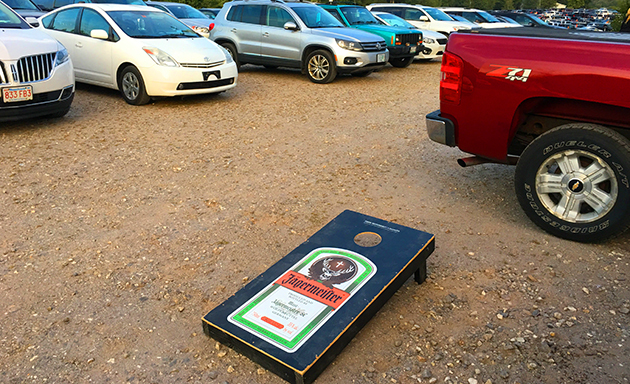 There is a small fee to park at the beach, but once you’re in, a beautiful lakeside afternoon awaits. If you sit towards the right side of the beach you can watch a variety of boats drive up the channel into Paugus Bay which is fun viewing for the kids. Although the beach does not have grills, they do allow beachgoers to bring their own charcoal grills and picnic tables are located throughout the lawn area of the beach. The pier is currently undergoing a major revitalization project which is such an exciting time, check out our blog for more information on the project here. Ellacoya is located in Gilford, NH on the southwest side of Winnipesaukee. This beautiful, sandy stretch of beach offers views across the lake towards the quaint town of Sandwich and the Ossipiee Mountains. With a wide variety of activities and amenities, you can spend a fully day of family fun at Ellacoya. One of the defining feature of this beach is the shallow sandy bottom that stretches far out into the lake. If you are looking to let your kids play in the lake without the concerns of deeper water, this is the perfect beach for you. There is a small fee to access the park. You can check out the park hours and fees here. Ellacoya also includes a concession stand, picnic tables, a picnic pavilion, playground, and bath houses. There is also a boat ramp available and canoeing and kayaking access. Opechee Park is located on Main St. in Laconia. The park includes beaches at Opechee Cove and Point, both of which are about 1400 feet. The park is also home to a field hockey field, soccer field, a 400M track, little league baseball fields, and two playgrounds. With all the amenities, there is plenty of space to run around for the little ones. The park also features a concession stand and picnic tables that can be found throughout the area. The beach itself isn’t very big, but it packs a lot of extra amenities without the crowds you would see at the other locations. Opechee is the perfect place to read a book while the kids splash around near the shore. If you are looking for a more low-key spot away from the tourist areas, this is the beach for you. Published on July 28, 2017 in Winnipesaukee Resort. Closed Tags: Lake Winnipesaukee Resort, nh resort, Weirs Beach. If you are new to staying with us at the Summit Resort, and are unfamiliar with the area, don’t fret because we are here to let you in on some of our favorite spots. Weirs Beach has everything from restaurants, arcades, and the boardwalk to live music. There is always something to do and explore. 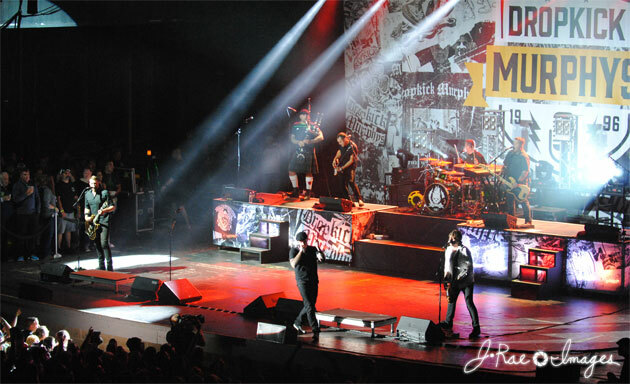 Check out some of these great places below and let us know what your favorites are! Weirs Beach: Weirs Beach is located on the shores of Lake Winnipesaukee. Spend the day at the beach with your family, swimming, building sand castles or enjoying a book. The beach does not offer charcoal grills but you are permitted to bring your own. Picnic tables are available throughout the lawn area of the beach. One of the most unique features of Weirs beach is the channel into Paugus Bay off to the side where you can watch all types of boats come in and out from under the bridge. Weirs Beach Boardwalk: The Weirs Beach Pier at the end of the boardwalk is currently undergoing a major revitalization project, check out our last blog (link) for more information. It offers many dining options, benches, souvenir stores and more. Arcades and Games: There are two main arcades at Weirs Beach. Located along the boardwalk is Half Moon Amusement Arcades there are actually two gaming areas within this location. There is the infamous Penny arcade which includes over 120 games from pinball to whack a mole, and the Family Fun Center arcade that offers classics from Pac Man to Galaga. The other big arcade in the area, Funspot, is just down the road from the main Weirs Beach area. Billed as “the biggest arcade in the world” it offers two floors of all the classics, bowling, an indoor 18-hole mini golf course and bingo five nights a week. There is also a Tavern where you can grab a drink and some small bites including pizza, and one of our personal favorites the mac n cheese bites. Ice Cream: There is nothing better than ice cream in the summer and you can find it just about anywhere, but our two favorite spots in the area are Jordan’s Ice Creamery and Kellerhaus. Jordan’s is a family run ice cream shop operating for the past 23 years. They home make all of their over 150 flavors of ice creams, they also have frozen yogurt and sugar free options as well as a variety of other novelties including homemade waffle cones. Kellerhaus is an ice cream buffet style joint. You pick your flavor and then hand pick your favorite toppings. They also have a gift shop where they are famous for delicious chocolates, candy, gift basket, jellies & jams and NH Maple Products. Options for the Active Traveler: If being active is your thing and you are looking for the next big thrill, check out Monkey Trunks. At Monkey Trunks, you can do either an adventure ropes course, or zipline tour, or both! There are height and weight requirements so check out their website for more details. If you have a need for speed, then the Daytona Funpark is for you. They offer go-karts, bumper cars, and batting cages. Scenic Adventures: Hop aboard the M/S Mt Washington for a cruise around Lake Winnipesaukee. They offer a variety of different types of cruises including a scenic, sunset dinner dance, and Sunday champagne brunch style cruises. Check out their website for more details and where to get tickets. If being on the water isn’t your thing you can check out the Winnipesaukee Scenic Railroad. Always within the views of the lake you will travel from Meredith to Lakeport. If you really want to take in the full experience ask about caboose rides, it’s one of the best kept secrets in Weirs Beach. While on the website check out the Rail & Sail package where you can ride the scenic railroad, then hop on the M/S Mt Washington cruise ship. Night Life: Weirs Beach is always rocking at night, with plenty of live entertainment and restaurant options you won’t be bored. Our favorites include Paradise Beach Club, Tower Hill Tavern and the Patio Garden. 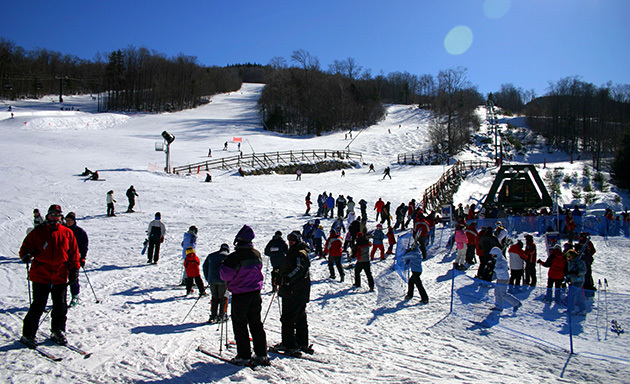 The Summit Resort is the perfect location in the heart of the NH Lakes Region. With so many attractions and activities within minutes of the resort, there is something for everyone. We hope you enjoyed this list and find it to be helpful when planning your vacation. If there are any attractions not on the list that you think would make a great addition we would love to hear from you! Published on July 19, 2017 in Winnipesaukee Resort. Closed Tags: eat local, nh hotel, Winnipesaukee Resort. Eating local is so important now a days, and as the weather and seasons change we are at peak season for a wide variety of fresh produce in New Hampshire. The Summit Resort is located right in the heart of the Lakes Region, which makes it easy to get direct access to a variety of farms, markets, and stands. Our favorite of the bunch is Beans and Greens located in Gilford just down the road from the resort. The Summit offers a unique feature that sets us apart from other hotels in the area, full kitchens stocked with everything you need. With access to a full kitchen guests can visit local farm stands and bring back fresh groceries to their room where they can cook up a meal for the whole family using locally sourced ingredients. 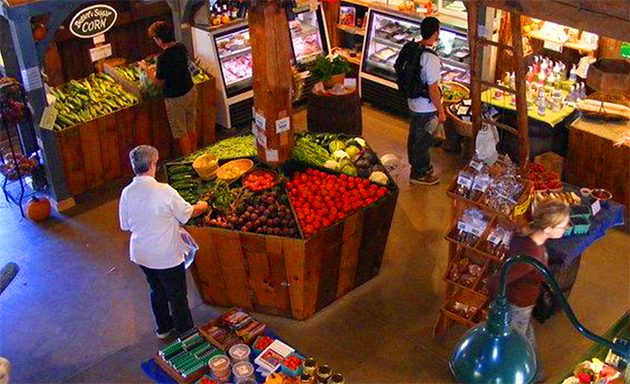 Not only does Beans and Greens grow and sell their own fruits and vegetables, they also sell local and organic meats, cheeses, pastries, pies, honey, jam, and a variety of other offerings. Aside from food and produce they have a large greenhouse where they sell a large selection of plants and flowers. They are a very family friendly place where there is a barn with animals and a corn maze in the fall. 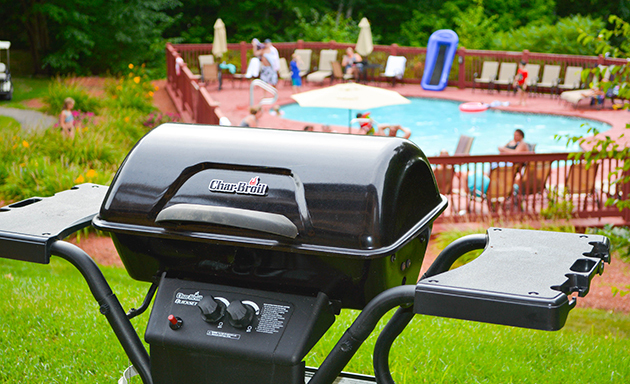 Once you get back to the Resort, take advantage of the outdoor grills we offer and fire it up to start cooking your protein of choice. 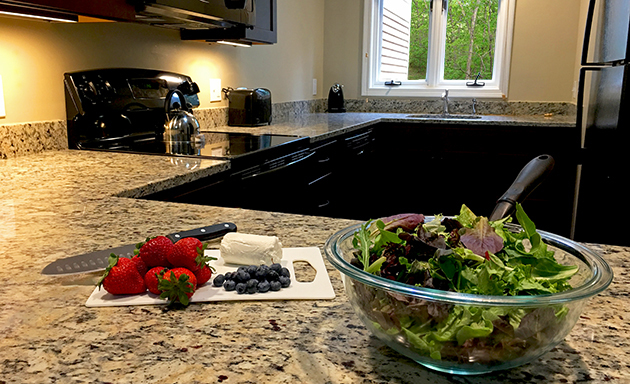 Whip up the Red, White, and Blue Salad in the full kitchen as a side to accompany your meal. Sit down at one the outdoor picnic tables, or gather around the dining room table in your room and savor the local flavors. I hope you didn’t forget that blueberry pie we mentioned. Throw it in the oven at 350 degrees for 15-20 minutes and you have the perfect summer meal. 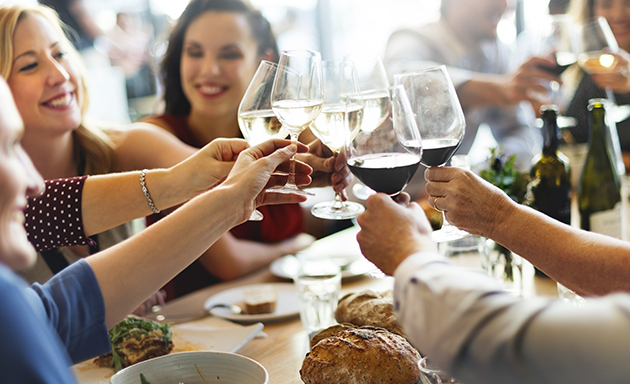 You don’t always need to go out to eat every night while on vacation, you can eat a fresh and healthy meal as a family at the Summit Resort while sampling some of the best produce available in New England and supporting local farms. Give your salad greens a good wash and toss in a bowl. Slice a cup of fresh strawberries and throw them on top of the bed of lettuce. Next add the blueberries, crumble the goat cheese over the top, and throw on your favorite dressing. Toss all together and you have a fresh and healthy side to go along with your protein of choice. Big things are coming your way with your next visit to the Summit Resort. The perfect setting for outdoor enthusiasts, guests can get to the heart of Weirs Beach within minutes by either a 1.5 mile walk, a bike ride or a short hop in a car. If you haven’t already heard, the Weir’s Beach Pier is undergoing a major revitalization project this season. For those that know the area, this is huge news! We are so excited for this welcome update to the main destination on the boardwalk. This project will give returning guests a brand-new experience and offer newcomers the opportunity to enjoy updated, local attractions. This renovation promises to maintain the historical character of the pier while bringing new stores, entertainment, and dining options to the boardwalk. 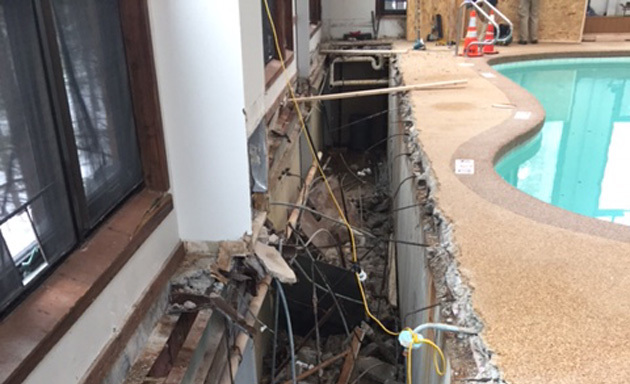 Although the complete renovation cycle could take up to 5 years, in the short term for this summer, new attractions include a general store, a new restaurant, and an arcade. Aside from the Pier itself, the boardwalk leading up to it will include an interactive Sal’s pizza where the kids can create their own pie. It will also include a Texas smoke shop, souvenir store, and a candy shop. So imagine waking up from your room at Summit Resort and seeing that it will be a beautiful day. Take your time and walk down to the beach for a swim, then stop in at the new candy shop for a bit of taffy on the walk back. We are so excited for this renovation and all that it will bring, we hope to see you there this summer exploring what’s new at the Pier with us!